Snap(shot) Judgements are posts that will appear with no real regularity. It’s primarily a way for us to get thoughts and photos up as soon as possible, especially when we have no plan to write a feature-length column on the subject. Here, Gary finally makes his first visit to the Red Hook Ball Fields and, more importantly, the food vendors that set up shop there. 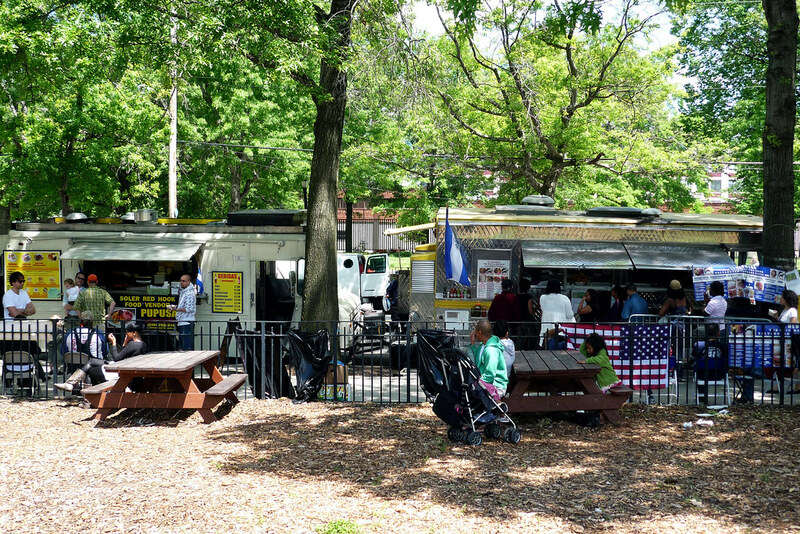 I’ve been hearing about the food vendors out at the Red Hook Ball Fields (corner of Bay St and Clinton St, Brooklyn) for some time now and the myriad of problems they’ve run into staying where they are. Back in the day (so I’m told), the vendors would set up tables and grills on the perimeter of the ball fields every weekend in a very makeshift way, serving up delicious Latin food. Not only was it makeshift, it was also sans permit or regulation, meaning that the city was unable to profit off their enterprise. Not missing a chance to capitalize on the crowds coming out to the fields, the city’s Department of Parks and Recreation attempted to put the area up for bidding, bringing thoughts of some multi-million dollar corporation swooping and commandeering food sales there. Determined to stay where they were, the vendors banded together, got some help from elected officials, and were granted a permit to stay. With the permit, though, came regulations so once where there were stands and grills on the sidewalk, there are now trucks. What hasn’t changed (again, so I’m told) is how great the food is here. On a beautiful Saturday morning, I biked from Astoria to Red Hook and sampled fare from two of the vendors. Yes, only two, but I shall return.